When I was first dating my wife in 1959, we attracted a lot of stares, not out of hostility, but of curiosity. The country was far different then, and most Americans had never seen an Asian. They usually assumed she was a war bride and spoke to her with exaggerated slowness and clarity. She, however, was as American as square dancing, a native California girl as was her mother. She answered them in slight accent that was not Asian, but New York Jewish from her early days of living on Long Island, working for a Jewish farm family. It was her mother, Sonoko, who made the wrenching change of cultures. This is her story and of her father who first came to America. I had written it many years ago as part of our family history and revised it as new details emerged from an estranged family that was still healing. It may seem heavy on details, but each one was uncovered with much effort and will be lost forever if not recorded. A deed unremembered never happened. A person unremembered never lived. It is a magnificent, inspiring human story of the will to persevere in the face of difficulties, a story repeated by many of our own ancestors who bravely left their homes forever, knowing they would never return, knowing they would never see loved ones again, and of their children who were the first generation in a new land. Internment by the U.S. government during World War II is thought of as the defining event in Sonoko Iwata’s life, but it was only one of several upheavals that she, always the outsider, bore with uncomplaining resignation. Sonoko was a born in Los Angeles on December 15, 1911. Her father, Francis Miyosaku Uyematsu, was a Christian and had recently come to America from the small town of Numazu, Japan. Despite it’s small size, Numazu was well known as the Thirteenth Station on the historic Tokaido Road where the slowly traveling Daimyo rulers with their huge entourages once stopped on their way to and from the new capitol of Tokyo and the old capitol of Kyoto. His family was prosperous and his Numazu home was a large family compound surrounded by orchards. Many Numazu Japanese were Christian and, like Francis, adopted Christian names suggested by missionaries. The Uyematsu family considered the founder of the family to be Genkaku Uyematsu, a physician to a prominent warlord, Shingen Takeda, 1521–1573. Francis’s parents maintained a Shinto shrine to Genkaku in their home. Many of Genkaku’s descendants were physicians, but Francis’s grandfather, Genjiro Uyematsu, owned a hotel during the end of the Tokugawa Shogunate (1868) that was exclusively for political prisoners on their way to exile on the Izu Islands. The hotel was in Katahama Village, adjacent to Numazu, and Genjiro donated part of the land to establish a Catholic church for his old government friend, Tsunenari Suzuki, who lost his job in the new Meiji Restoration. Genjiro served as church sexton, even though he was not a Christian. His daughter, Tomi, who was Francis’s mother, was baptized there along with Francis and all of her other children. The church is now the Numazu Catholic Church. Genjiro also founded the Katahama Bank, now the Numazu Bank. Francis’s father, Genichiro Watanabe, had taken Tomi’s family name, as is common in Japan where family names often indicate political ties rather than true blood lines. Francis grew up privileged, but sickly, too sickly to work at any real job or even fully attend school. He was, however, healthy enough that he could be drafted into the Japanese army. When the Russo-Japanese War broke out, Francis, with his family’s support, sailed for America in October, 1904, when he was 23, expecting to return after the war. The ship’s doctor knew him well (probably paid to look after him) and suggested he stay with Japanese friends who managed a sugar-beet plantation just outside of Salinas, California, near San Francisco. There Francis thrived, gaining good health that lasted his lifetime. There, too, he met Makoto Kobayashi, a vice-pastor at the Salinas White Presbyterian Church, and was again baptized. The full pastor of the church transferred to Los Angeles and Francis followed him there. In 1908, he and a fellow church member, Itsusuke Zaima, formed a nursery business. Francis had no special knowledge of horticulture and primarily oversaw the business part of the enterprise. He thought the cherry and camellia trees he knew from Numazu would appeal to Americans and began importing them from a Yokohama wholesaler. They sold them very successfully from a horse-drawn cart in upscale neighborhoods such as Beverly Hills. In 1912, the partners split. Francis bought five acres of farmland in Montebello (about 7 miles east of Los Angeles), built a house, and opened his own Star Nursery. In 1915, the US government placed an embargo on importing foreign plants, and Francis put all of his resources into buying as many Japanese camellias as possible before it took effect, leaving him as the leading camellia supplier in a scarce market. Miyo arrived in America and soon became pregnant with Sonoko, but their marriage did not last. Miyo, a city girl, came from a wealthy family who owned a business that manufactured hair dye, and she enjoyed Japanese culture. She had performed professionally on the classical koto and was not happy as a pioneer mother isolated on a rural California nursery farm. She left for Tokyo when Sonoko was two years old. Francis reluctantly arranged for Sonoko to live with his parents in Numazu, the first of many upheavals in her life. This was a long sea journey, and Miyo probably took her along when she left. In Numazu, Sonoko was primarily cared for by her grandmother, Tomi. These were happy times. Sonoko lived upstairs in the family compound with her doting grandparents while uncles and their families lived on the ground floor. Behind the house were fields of fruit orchards where she could walk to the shore of Suruga Bay with its view of Mount Fiji. She was surrounded by loving family. Her friends were daughters of the local mayor and physician. Miyo, now with the surname Inoshita, had remarried and traveled to Manchuria with her new husband. Despite the scandal of the divorce, she was still a blood member of the Uyematsu clan and remained in touch with Sonoko over the years. Photos of Miyo in her 80s are almost identical to those of Sonoko in her 80s. 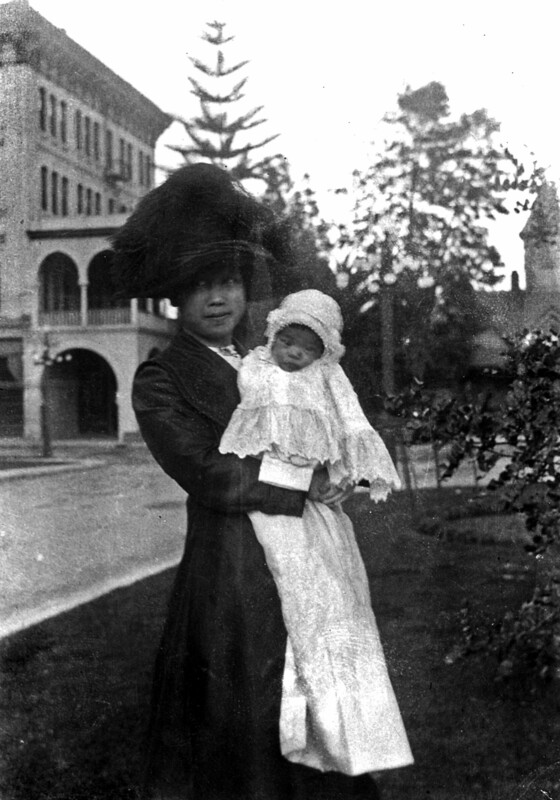 In 1922, when Sonoko was 11 years old, they decided it was time she rejoin her father in Montebello. She does not remember any reluctance to leave her grandparents’ home, but she always spoke of Numazu with nostalgia. 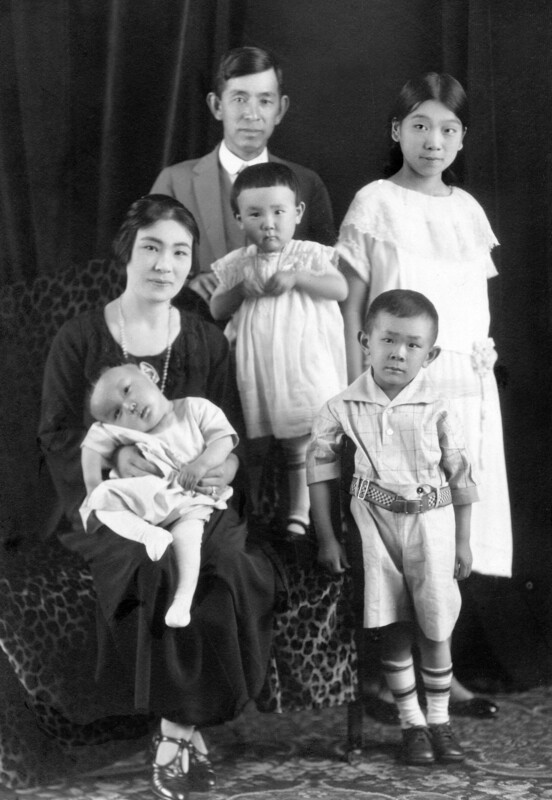 Sonoko with Francis, Kuni, and their children. Sonoko was again the outsider. She was living with strangers in a house she barely remembered. She was clearly still her father’s favorite, but her relationship with her step-mother was strained. Sonoko must have been a constant reminder of her father’s previous relationship with the glamorous and cultured Miyo, everything Kuni was not. She remembered being careful not to wear her best kimono in Kuni’s presence because it had been given to her by Miyo. Sonoko spent much of her time babysitting her step brothers and sisters. Kuni tutored her in written Japanese, so she became fluent in both written and spoken Japanese and English. In school, she was still the outsider. She had to begin in the first grade but was twice the age of the others. She soon jumped the grades and stayed in school until 1931, her junior year when she was 19. It was then she left Montebello to attend Mrs. Hani’s School (Jiyu Gakuen) in Tokyo, a two-year junior college, or what was then called a finishing school, and returned to Montebello after graduation. 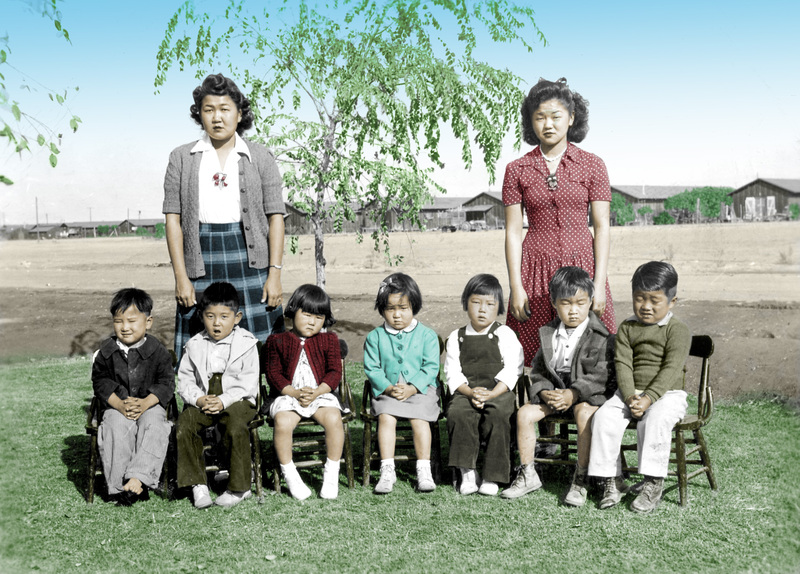 Going back to Japan for education was common for Japanese-Americans. When they returned they were henceforth known as kibei (KEE-bay)—born in America, educated in Japan. She did not live at Montebello long. For the next two years she lived where she worked at a nearby Japanese children’s home as a practical nurse where she also taught a little Japanese and went to night school to learn typing and to improve her English. By 1937, she was pressured to marry because the older daughters were expected to marry before the younger. A mutual family friend acting as a matchmaker arranged a family meeting with Shigezo Iwata, an eligible Christian bachelor living in America, and the engagement was accepted. Immediately rumors surfaced about Shigezo’s lifestyle while he had earlier been living in New York City. Sonoko’s family broke off the engagement that same day and began looking at other candidates. But she and Shigezo kept secretly in contact, and in about six months, Sonoko—disobeying for the first time in her life—left her family to marry him in a civil ceremony, causing a family estrangement that lasted almost a lifetime. Shigezo was born January 1, 1900, in Otaru, Hokkaido, the cold, northern, and least-populated island of Japan. He was of Samurai family, Kaga clan of the Ishikawa ken, a family who had long ago emigrated to Hokkaido to start a winery. He became a Christian and, in 1923, graduated in business from Tokyo’s prestigious Waseda University. While at Waseda, he lived in a Christian dormitory and excelled at kendo, the Japanese sport of sword fighting using bamboo sticks. His family had earned their Samurai status by being kendo instructors to the Imperial family. He worked briefly for a woolen factory but longed for adventure and the company of other Christians. His father, Hidenori, had died in 1911, and Shigezo used his inheritance to emigrate to America. He enrolled at universities in Michigan, Ohio, and New York City, but the language barrier proved too much, and he finally gave up the idea of further education. He moved to Los Angeles in 1935 and was working as a Japanese school teacher when introduced to Sonoko. Newly-married Sonoko and Shigezo moved to rural Indio, California, about 30 miles southeast of Palm Springs, where Shigezo worked as a secretary for a Japanese farmer’s association. When war with Japan broke out in 1941, the family had grown to include children Masahiro, 3, Misao, 2, and Miki, 1, and they were all scheduled to be interned with the other local Japanese-American families. In March, 1942, Shigezo alone was taken by the FBI as an enemy alien to a prison camp, first in Santa Fe, then in Lordsburg, New Mexico. Although he had done nothing wrong and despite being a devout Christian, they only saw him as a Japanese citizen of a warrior Samurai family, who spoke little English, who had no American friends, and was working for a possibly nationalistic Japanese organization. They were even suspicions about an American flag they discovered folded in his closet, but he had only found it in an abandoned farmhouse. Families were not usually separated, and it was then that Sonoko began her almost daily correspondence with him. Her letters, written in English to pass rapidly through the censors, described her everyday life during the move and the first year at the internment camp. Shigezo saved these letters that are now preserved at the Historical Society of Pennsylvania in Philadelphia where even family members can only touch them with gloved hands. The Poston Internment Center was built on the Colorado Indian Reservation with the idea that the industrious Japanese-Americans would improve the land and eventually leave the improvements for the Indians. The Indian Tribal Council rejected the idea, but the Bureau of Indian Affairs overruled them, and the project preceded. The Poston Internment Center was actually three centers, three miles apart, enclosed by a single fence. The internees nick-named them Roastin, Toastin, and Dustin. The location was so remote, guard towers were thought unnecessary. The Colorado River was about three miles from the camp. The population of internees was over 17,000. The camp officially opened as the Colorado River Relocation Center on June 1, 1942. Sonoko mentions in her letters that she had no income, but a leader of the Japanese-American community advised her not to apply for welfare—they would help her with her needs. She also mentions occasional money sent secretly by her father. Sonoko struggled to raise and care for her children for over a year, but always worked to have Shigezo returned to them. With her fluency in English and her American church contacts, she was far better able to do this. Misao, seated third from right, at Poston. Colorized photo. Barracks in the background. In July, 1943, Shigezo was paroled and rejoined the family in Poston. They remained in the camp for another two years until August, 1945, just before the end of the war. By then, U.S. officials had realized the internment of Japanese-Americans was unnecessary, probably unconstitutional, and was a national embarrassment. The internees were permitted to leave the camps if they had employment. 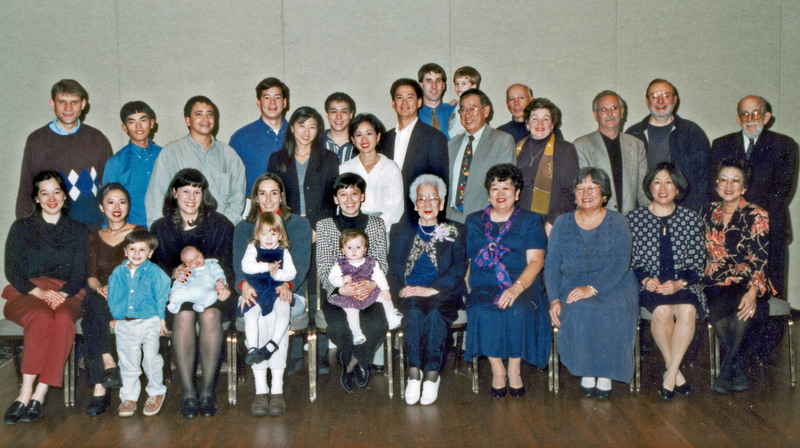 The Iwata family moved to a dairy farm on Long Island, NY, where Shigezo worked as a cook for a Jewish family. Meanwhile, Charles F. Seabrook, founder of Seabrook Farms Frozen Foods in Seabrook, New Jersey, had recruited many other Japanese from the internment camps to work in his freezing plant where they could live in company housing. (John Seabrook, grandson of C. F., is a well-known writer for The New Yorker magazine.) The following year, the Iwata family, now with another daughter, Michi, moved to Seabrook. Shigezo worked in the plant as a laborer and, in 1948, Sonoko also began work at the plant as a packer where both remained until retirement. There, they were happy as part of a large Japanese-American community where everyone had the same values and everyone knew, helped, and supported each other. Although their life was not financially rewarding, they were able to send all of their children on to higher education. In 1952, the U.S. government revised the naturalization laws to permit for the first time Japanese-born aliens to become citizens. Shigezo earned his citizenship in 1953, along with a flood of others,. Francis’s nursery business could not possibly continue with his internment. Even with internment imminent, he was able to sell much of his camellia supply at a fair price to Manchester Boddy, newspaper publisher and president of Richfield Oil. Boddy planted the camellias on his personal estate that he later developed into what is now the well-known public Descanso Gardens in Pasadena, much like Longwood Gardens. Francis’s nursery also grew cherry trees, and he had developed strict methods of growing them in the difficult conditions of Southern California, but without his oversight, virtually all died within ten years. Returning from internment, Francis sold a large parcel of land from the decimated business to the city of Pasadena for their high school, but the Star Nursery survived and is now run by the family on 20 acres in Ontario, California, a suburb of Los Angeles. It specializes in junipers. In a belated reconciliation, Francis, a tiny, meticulously neat man, and Kuni, who dressed in the style of my grandmother, visited the Iwata family in Seabrook in 1962. The family was now complete with children Masahiro, Misao, Miki, Michi, and Misono. Masahiro graduated from Rutgers as a ceramic engineer, worked in Baltimore, and raised three children. Misao (my wife) graduated from the Hospital of the University of Pennsylvania Nursing School, worked in Wilmington, Delaware, and has two children. Miki graduated from the Presbyterian Hospital Nursing School in Philadelphia, joined the Navy, and retired as a Captain after a long career. Michi attended Ursinus College, raised three daughters, and lives in St. Louis. Misono graduated from Cedar Crest College and has two children. Shigezo died of colon cancer in 1986, and a few years later Sonoko moved in with Misono and her husband in Millville, NJ. At last, Sonoko was no longer the outsider. A tiny, uncomplaining woman with a positive, gentle manner and a quick, pleasant smile, she attracted attention wherever she went. Total strangers were instantly drawn to her and would often stop to talk and eagerly help her with any little thing they could. Sonoko with family on her 88th birthday celebration. On her eighty-eighth birthday, a significant one in Japanese culture, she was surrounded at the celebration by her large extended family of twenty-nine members and growing. She enjoyed life right up to the end—the activity in Misono’s home, her church, professional basketball, her local senior center, and traveling with family. Sonoko died on January 11, 2004, after a short illness. This entry was posted in History and tagged Evacuation, Indio, Internment, Japanese-Americans, Manzanar, Montebello, Numazu, Poston, Relocation, Seabrook, Star Nursery. Bookmark the permalink. I am writing a book on the occupants at Poston, Arizona block 42 and would like to include some photos of the Iwata family members. The book is one of a collection on the individual blocks at Poston, Ariz and being used in conjunction with the Poston Community Alliance with profits going towards their preservation projects.